The Man and I have been wanting to try this restaurant for some time, but we’ve always been confounded by full parking. We finally had a chance to eat here when we found ourselves in the area at around 10:30am (quite a bit before the lunch rush). 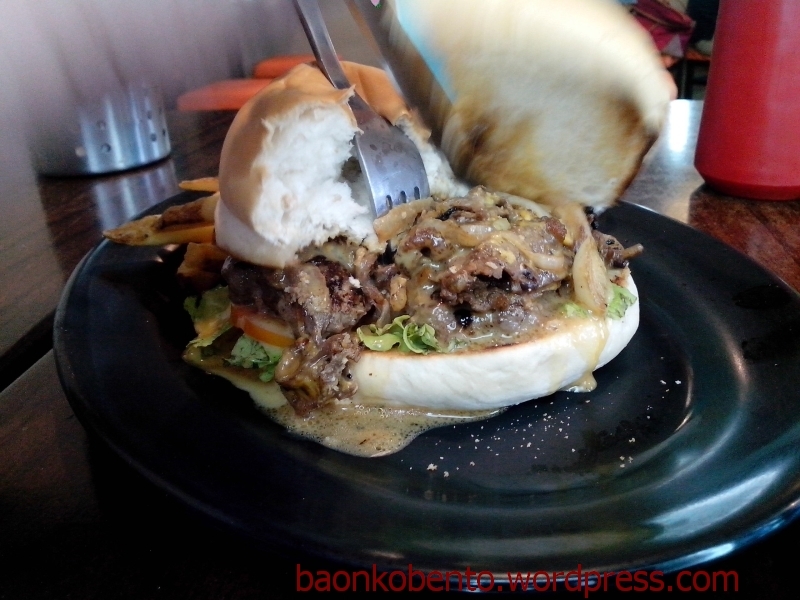 Zark’s Burgers is located on the second floor of the building that also houses Flaming Wings, along Katipunan Ave. The restaurant (which can seat maybe 20-25 people) had a couple of groups eating when we arrived, so there were lots of seats available. The strangest thing happened: they have this weird seat-and-table arrangement that they refused to adjust when we requested that both of us be seated on the couch. It’s a bit hard to explain, so just take a look at this picture and the one above. In the end we just took the table at the very end when the couple who sat there finished eating. That was the only set of tables that would allow both persons to be seated on the couch. This…weird customer service set a bad tone at the start of the meal. Fortunately, the food is quite good. Our first order was the Philly Cheesesteak Burger from the Major League Menu, which came with fries and drink, and the drink can be upgraded to bottomless. The burger came with a generous amount of cheesesteak and caramelized onions, and was in fact swimming in cheese-gravy sauce. 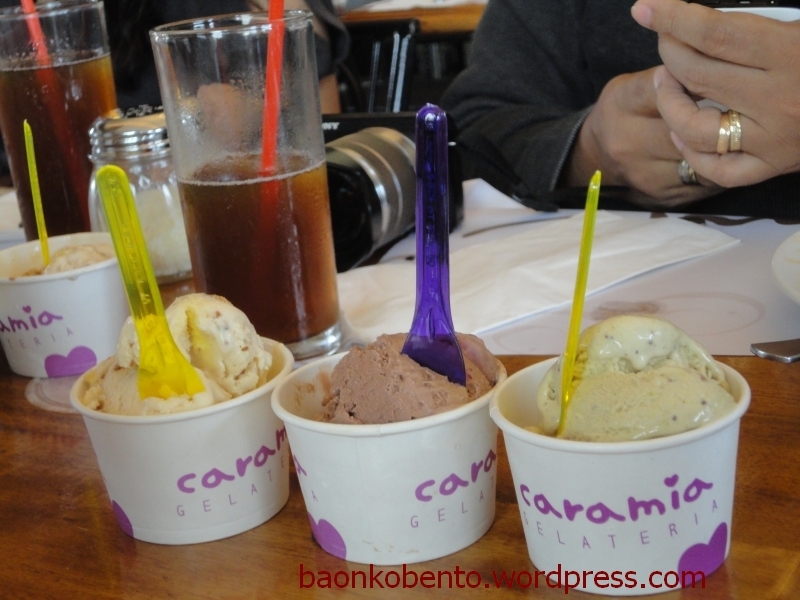 The whole thing costs Php180 (excluding the drink upgrade). This burger was really good, and we will definitely order this again. Our second order was the Deep Fried Bacon Burger, which wasn’t on their regular menu. It also came with fries and drink (which we upgraded as well). This is basically a regular 1/2 pound burger, wrapped in a generous amount of bacon. Yes, the whole burger (including the bun) was wrapped entirely in bacon. It also came with a sweet sauce which was intended to be poured over the bacon (or for the bacon to be dipped into). This costs Php240 I think. This burger was tasty, except it felt really oily as it is deep fried. Even the bun was oily. The bacon was really nice though, and the sweet dipping sauce made it really pop. The oiliness is a huge factor though (it seeped into the bun! ), so we probably won’t be ordering this again. Summary: The food and value-for-money is excellent here, but there seem to be a huge hurdle in the form of parking. I would definitely want to try their other offerings. The Man and I (actually more him) are big fan of chicken wings. We discovered this pretty awesome place in one of our rambles around one of our favorite malls, Megamall. 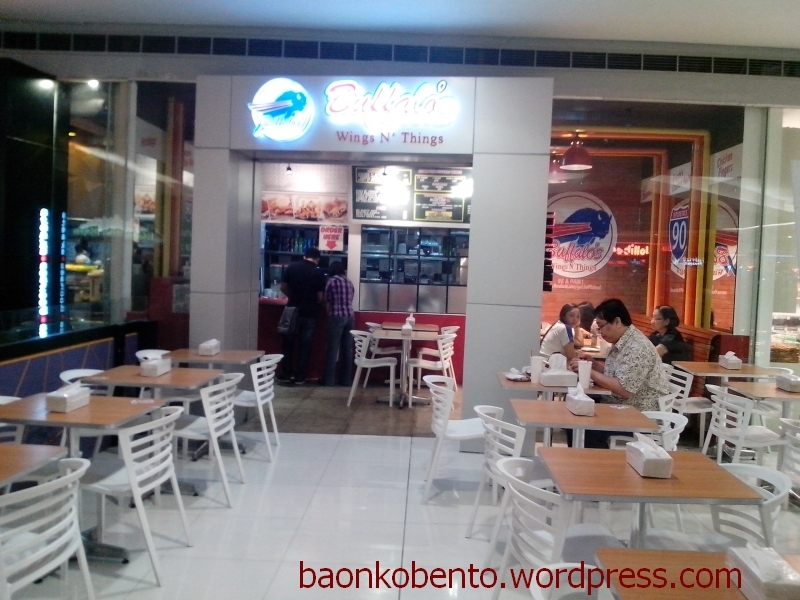 Buffalo Wings and Things is an unassuming restaurant located in Mega A basement, near the events area. 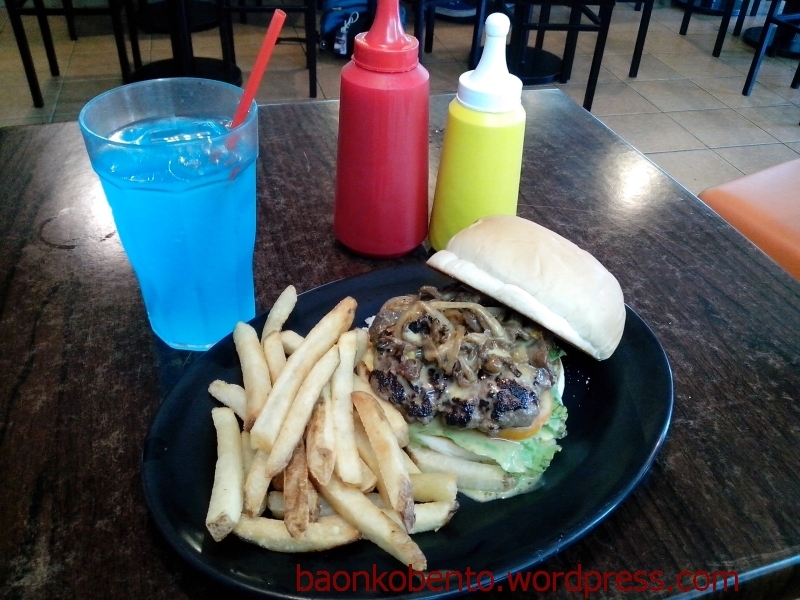 Nearby establishments are Sumo Sam, Toy Kingdom, and the north side of the food court. It’s a pretty small place, filled with mostly couple-tables that spill out the front of the restaurant. However! The most important feature of this restaurant is those packs of tissue for each table. For a place that will require you to eat with your fingers, this just makes sense! The counter is all the way inside, beside the kitchen. They have a big standee of their menu out in front of the tables. If you’re eating brunch to a late lunch/early dinner, you may also want to check out their Fan Faves, which is a selection of their best sellers at a great price. Our standard order is as follows. For me, I get a Set A from the Fan Faves menu, which gives me half a pound buffalo wings of my choice of flavor. My favorite is Garlic Parmesan! This set also gives me a side of NY Dirty Rice (which I share with The Man) and a regular sized Downtown Iced Tea, which I would upgrade to a large one. This costs Php199 + Php20 for the tea upgrade. The Man’s order is 1 pound buffalo wings of his choice of flavor. We’ve tried different variations but I think he has settled on the Firehouse Classic as his favorite. He gets a large Downtown Iced Tea and a Bleu Cheese add on as well. 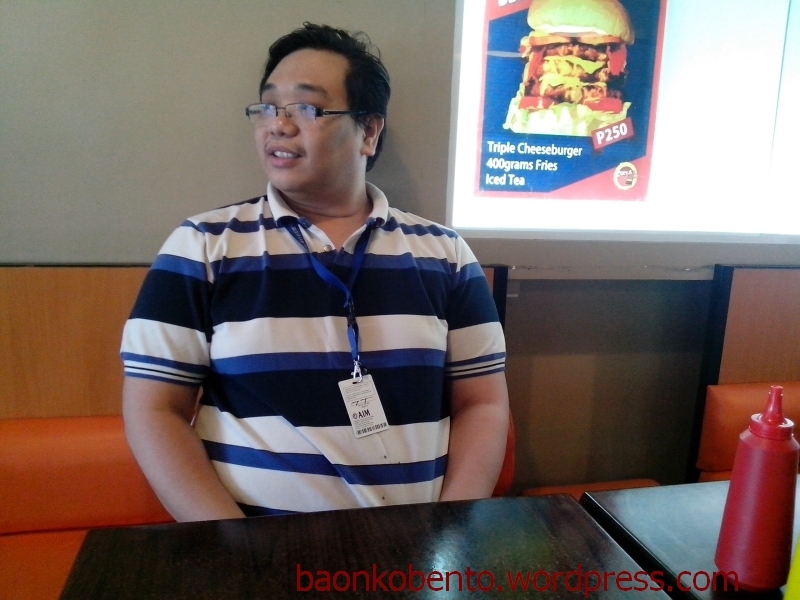 His order comes up to around Php380. 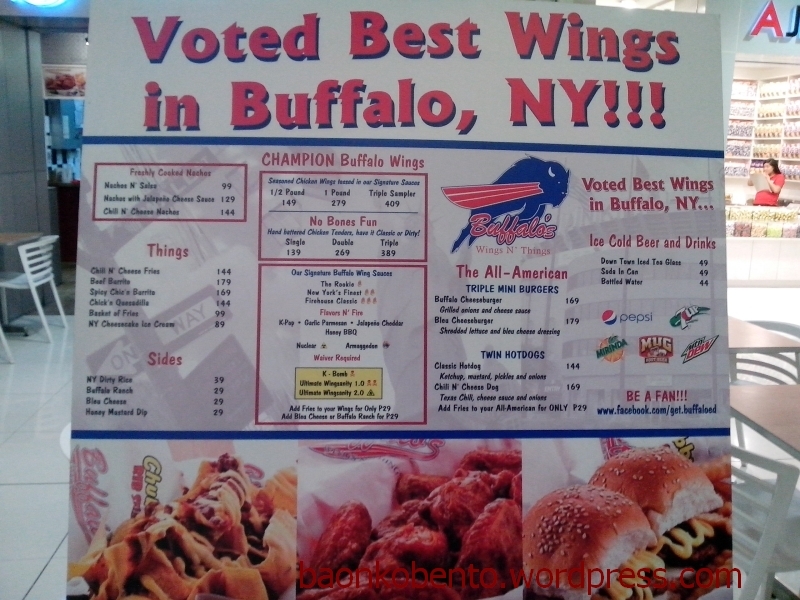 Summary: Our new favorite place to get wings! 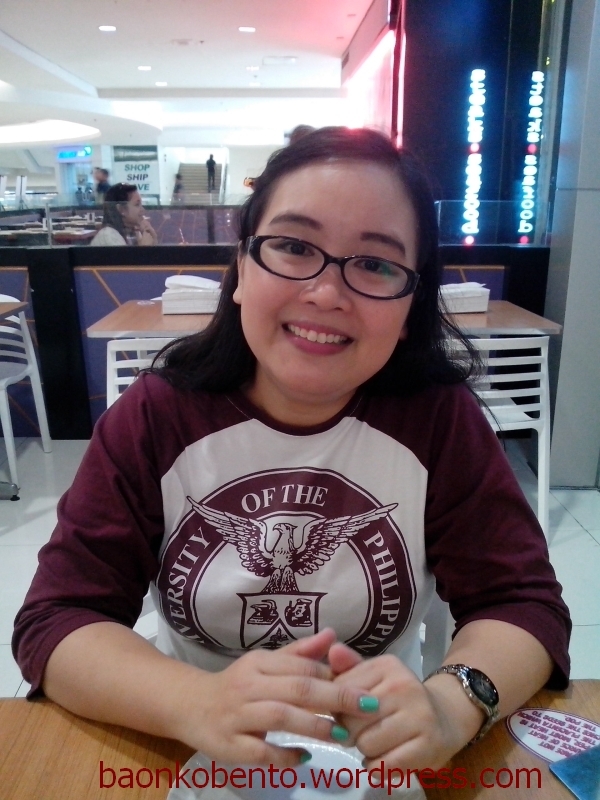 It’s where we would usually eat whenever we find ourselves at Megamall. Pretty great flavors, acceptable ambiance, excellent service, and a good supply of tissue! 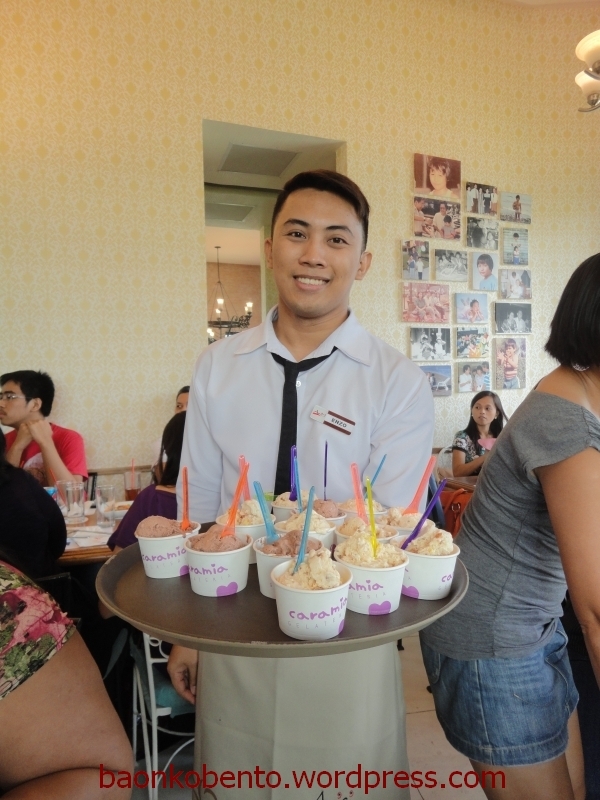 One of the best places to get gelato is Amici, which is actually an Italian fare restaurant. I had the opportunity to try out their ten (yes ten!) new dishes, and I would like to share them with you. 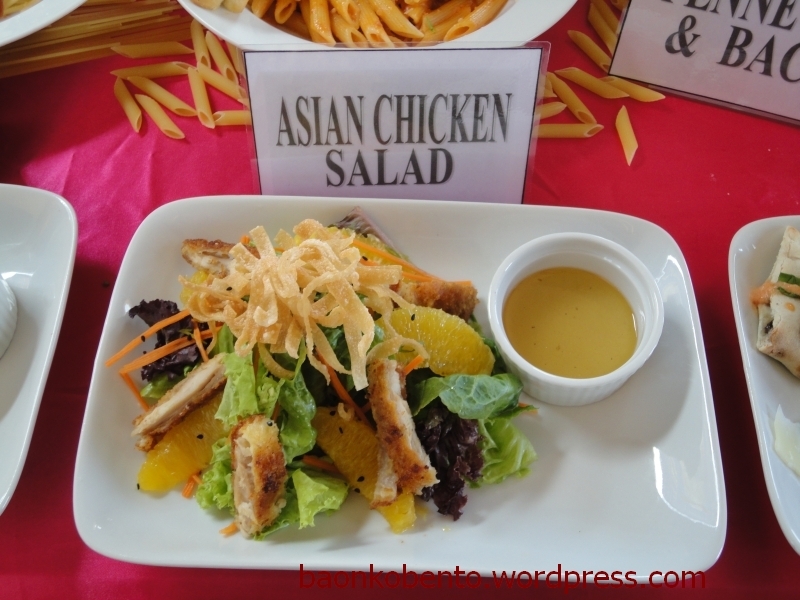 One of their two new salad offers is this Asian Chicken Salad. 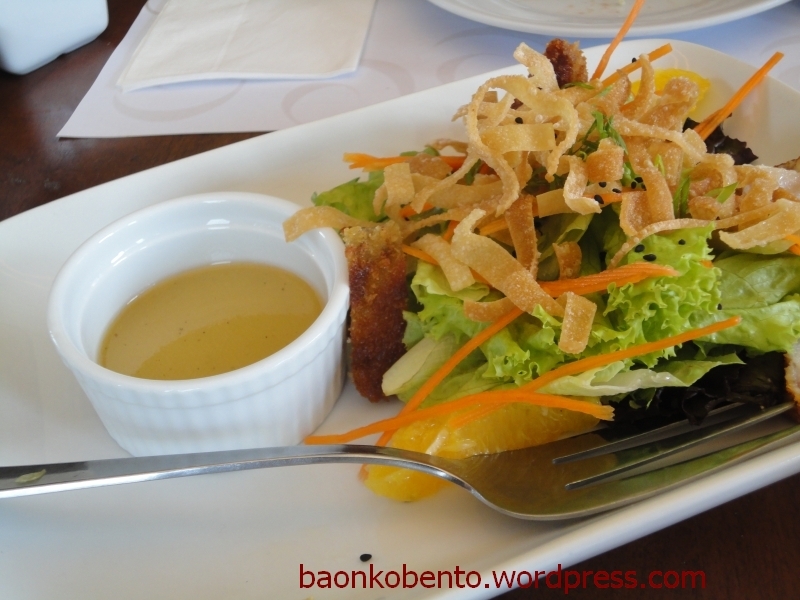 It has breaded chicken slices, oranges, carrots and lettuce with sesame dressing. What makes this interesting is the fried wonton strips that top the salad. I really like the combination of the dressing with the oranges. This is a big salad and can definitely be shared among 2-3 diners. 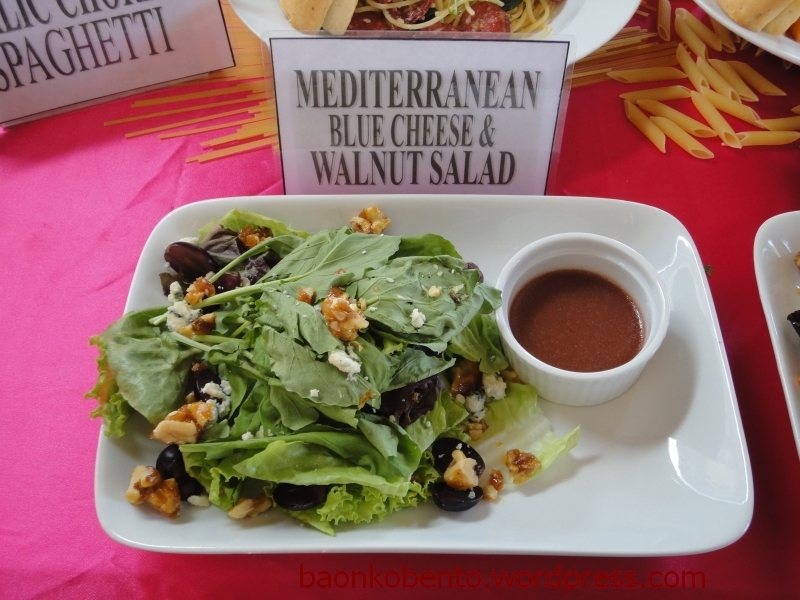 The second new salad offer is this Mediterranean Blue Cheese and Walnut Salad. As you can gather, it has crumbled blue cheese, candied walnuts, arugula, and grapes along with some lettuce. 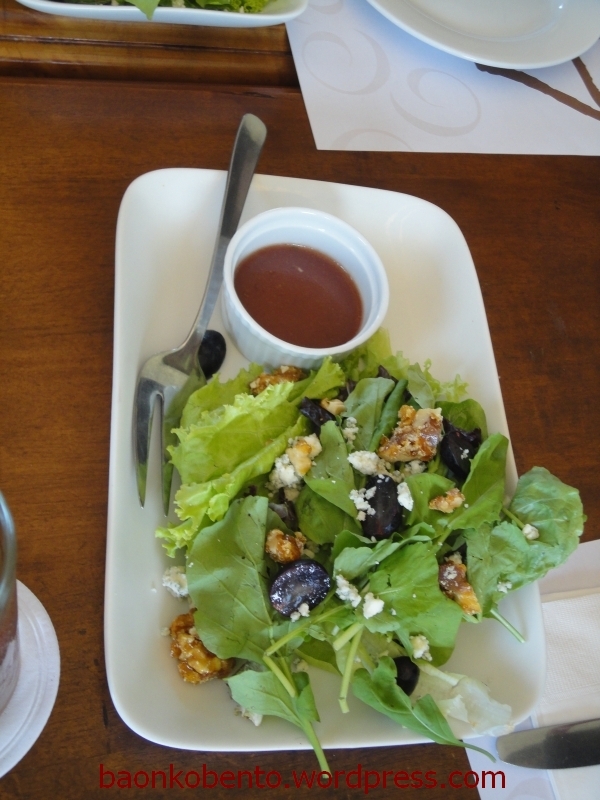 It is served with red wine vinaigrette, which is a great contrast with the candied walnuts. I enjoyed the fact that this is a completely different salad than the Asian Chicken Salad, but both are quite good in their own rights. Amici introduces a new form of pizza: the pizza roll. Both of these rolls have prosciutto (thinly sliced dry-cured ham). This first roll has artichoke cream, cream cheese, prosciutto, and arugula, with reduced balsamic vinegar. This is an interesting appetizer, and can be a whole meal in itself. 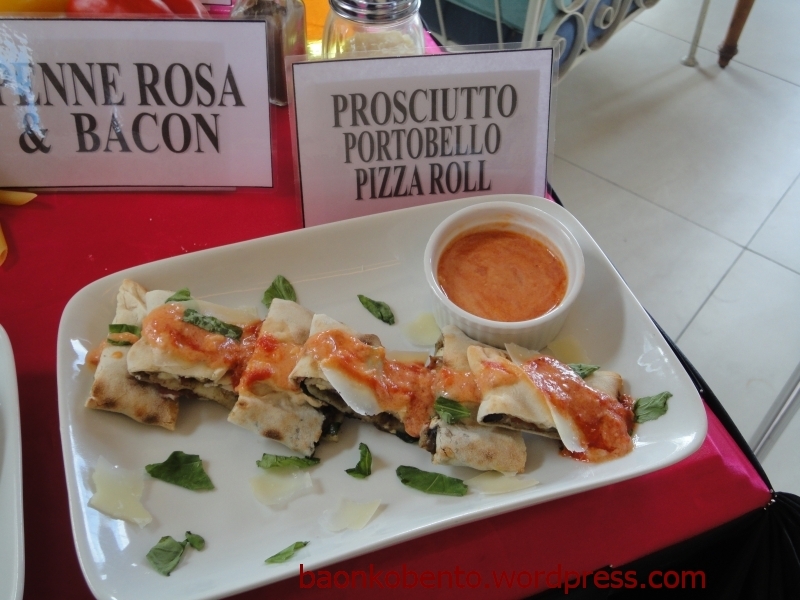 This second pizza roll has prosciutto, portobello mushrooms, cream cheese, and arugula served with roasted garlic dip. What is Amici without pizza? 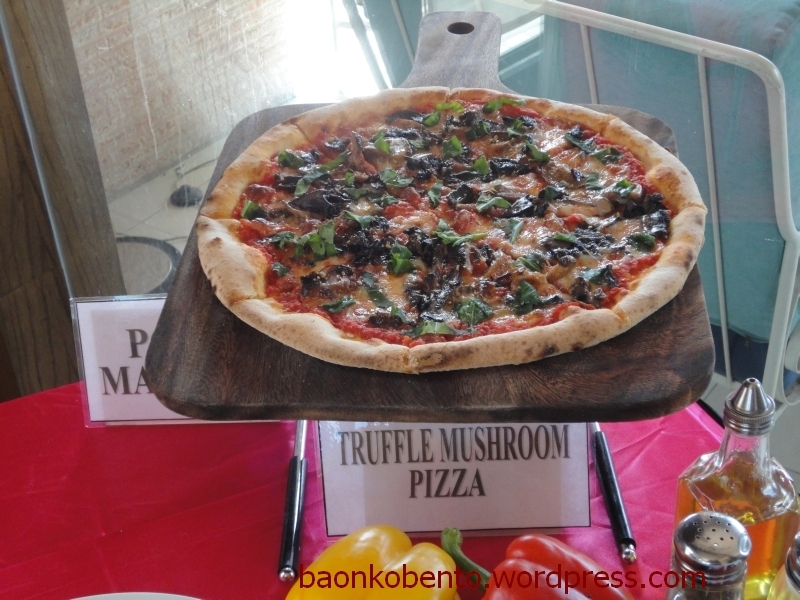 Their newest flavor is this decadent Truffle Mushroom Pizza, which is a pizza with portobello, shiitake, and porcini mushrooms for toppings. It also has truffle oil, mozzarella cheese, and arugula leaves. As a mushroom lover this is quite a hit for me. The cheese is also generous. This pizza overall is really quite delicious. What is top-crust, you ask? 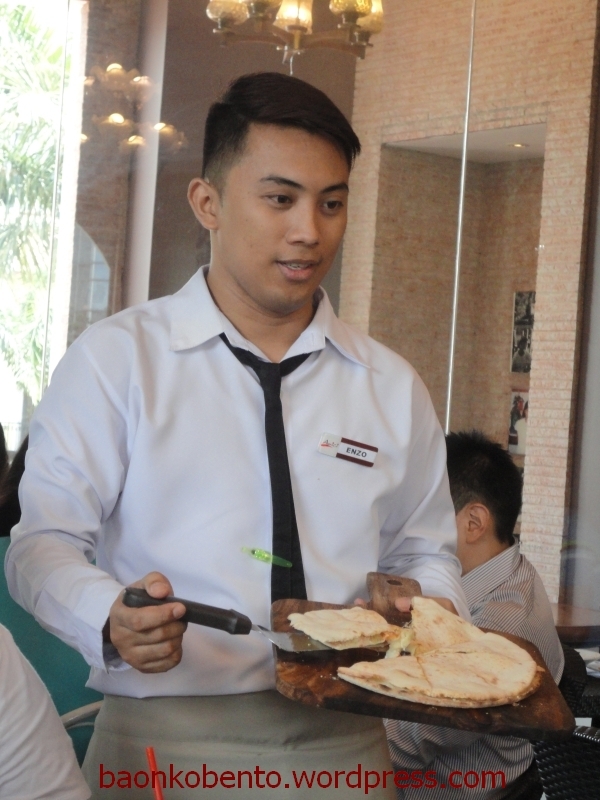 It is a new style of pizza where the “toppings” are sandwiched between two incredibly thin pizza crusts. 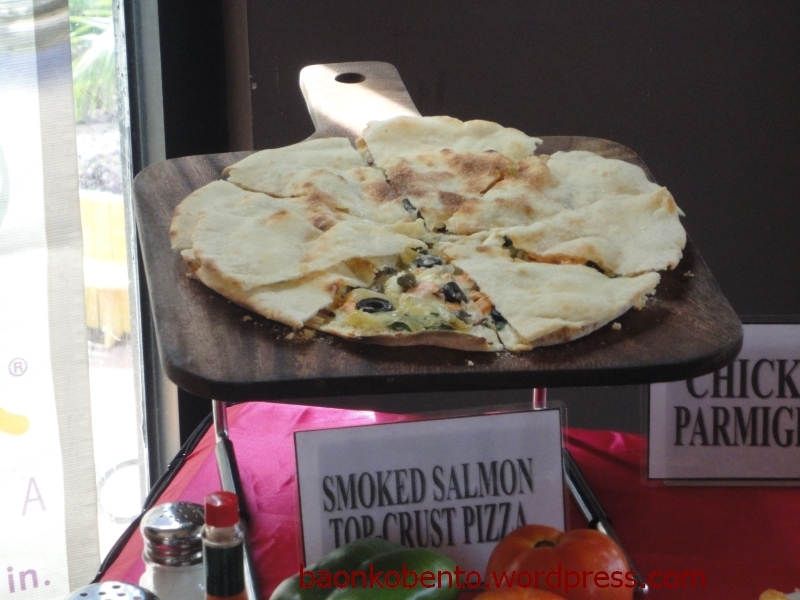 This dish has smoked salmon, capers, black olives, tomatoes, bechamel sauce, and mozzarella cheese, sandwiched between crispy crusts. An Italian restaurant will be no such thing without pasta. 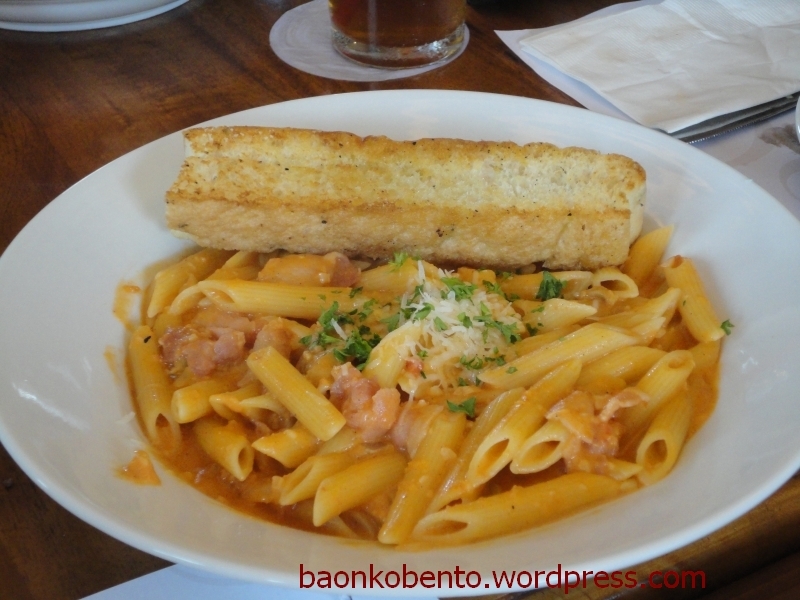 The first of Amici’s new pasta dishes is Penne Rosa and Bacon, which is bacon, pomodoro, and bechamel sauce sauteed with mushrooms, garlic, and onions. I really loved this dish, and is my uncontested favorite of the ten. It doesn’t hurt that there is a generous amount of bacon in this dish. 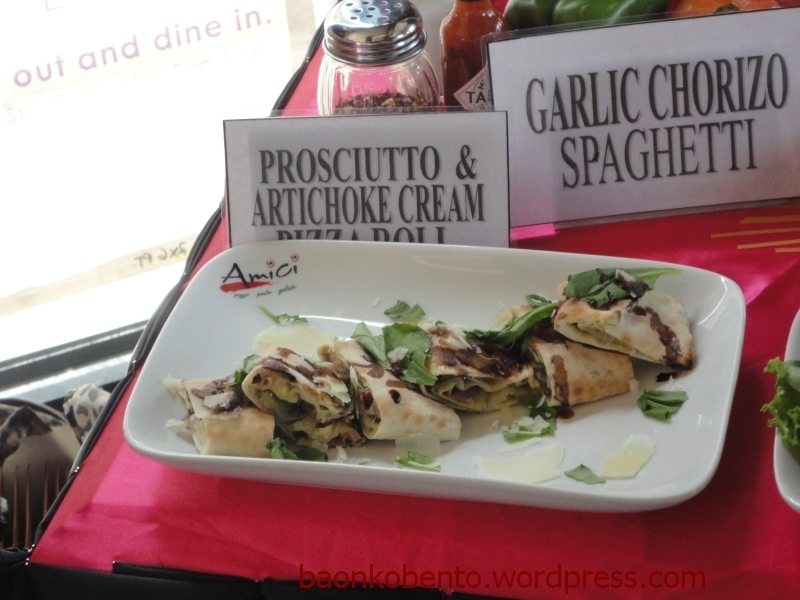 If long noodles are your thing, Amici also has a new offering that might interest you. 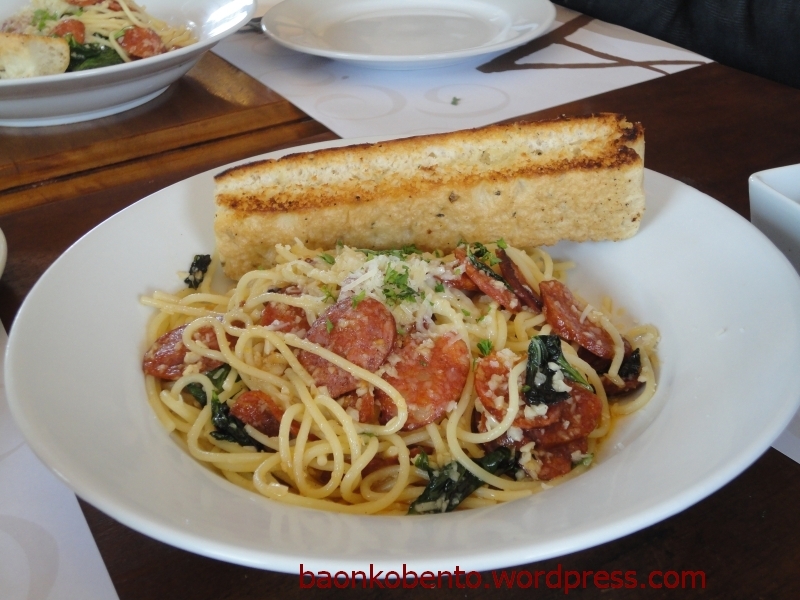 Garlic Chorizo Spaghetti has a lot (believe me it’s really a lot!) of Spanish chorizo sauteed in garlic and olive oil. Garlic lovers will rejoice that there is a good amount of garlic in this dish. Amici is now offering rice meals. The first is this gigantic plate of Chicken Parmigiana, a big slab of breaded chicken topped with tomato meat sauce and mozzarella cheese, served with rice pilaf and some roasted vegetables. My daughter loves parmigiana, and would probably enjoy this dish a lot. 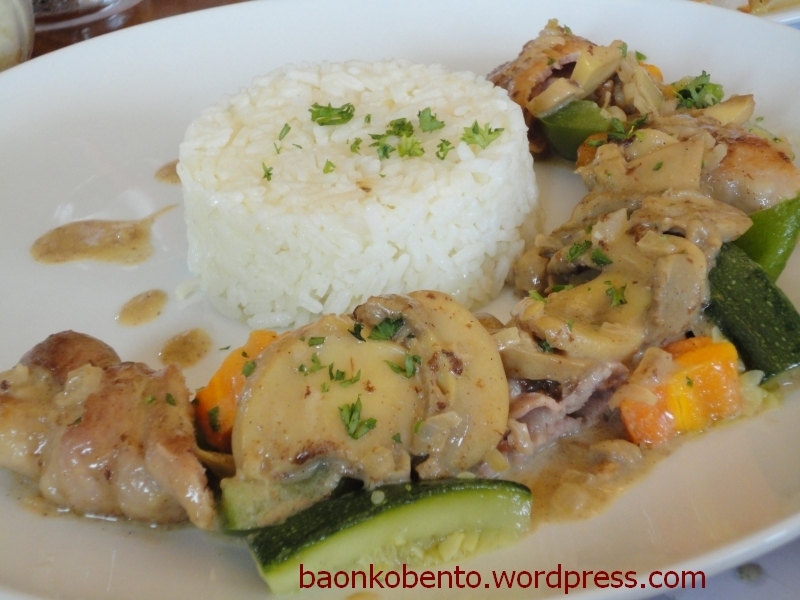 The second rice meal (and the last of the ten new dishes) is Pork Marsala. It is basically rolled pork filled with ham and cheese, button mushrooms, and cream, all reduced in marsala wine and served with rice pilaf and some roasted vegetables. I particularly enjoyed this dish even though it was one of the last I tried (I was quite full at this point!). This is quite tasty and the fillings are generous. 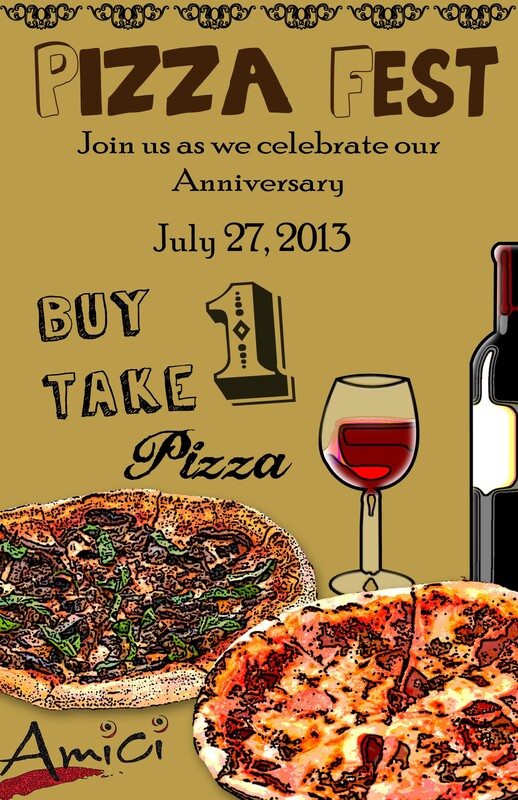 Amici is celebrating its anniversary this Saturday, July 27 2013, and is having a Buy 1 Take 1 Promo! For every pizza you order, you will get a free pizza (either Tutta Carne or Margherita)! 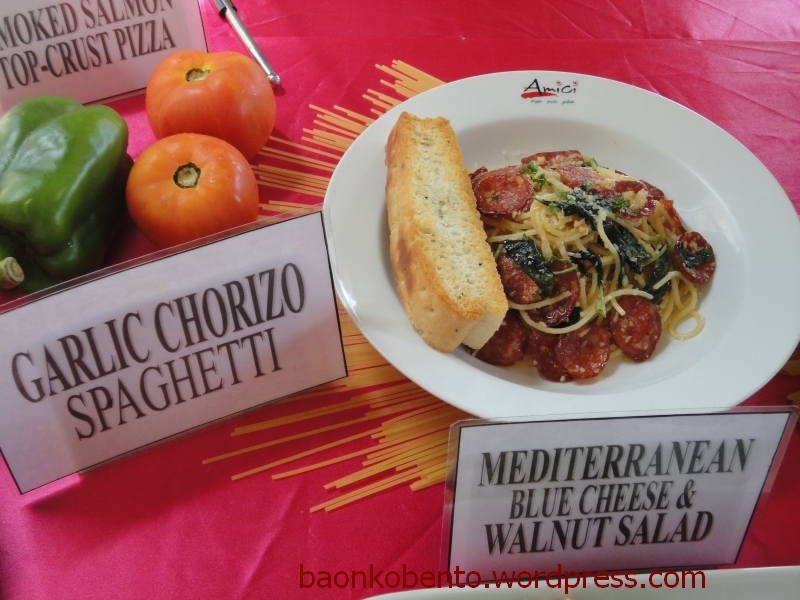 This is available in all Amici branches and valid for all dine-in and take-out transactions. Remember, this is a one-day-only promo so don’t forget to catch it! Thanks to Marcie and Amici for inviting me! 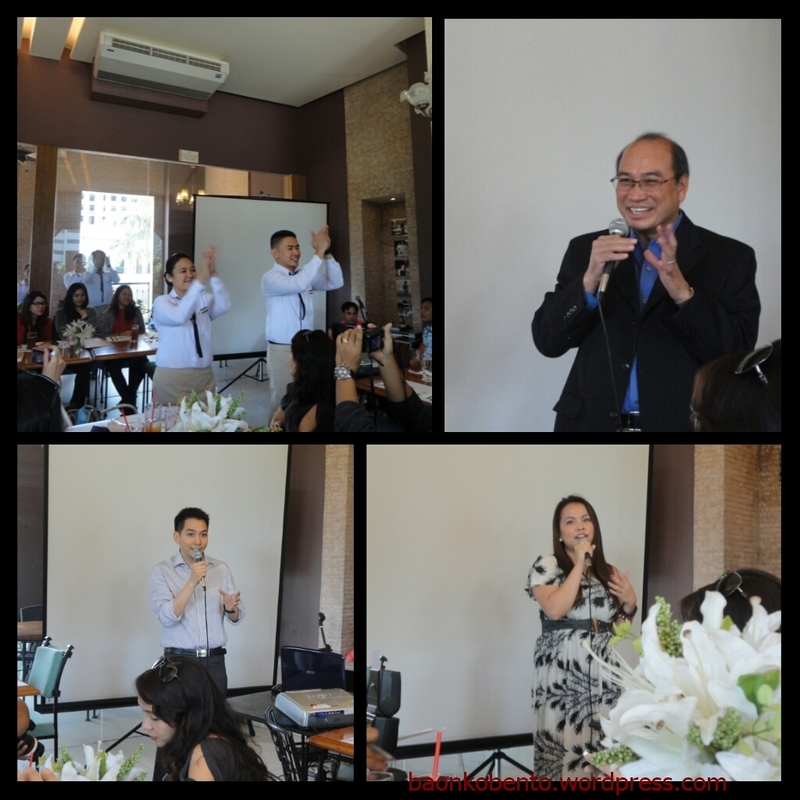 For more information about Amici, visit their website at www.amici.ph or interact with them on their Facebook page. 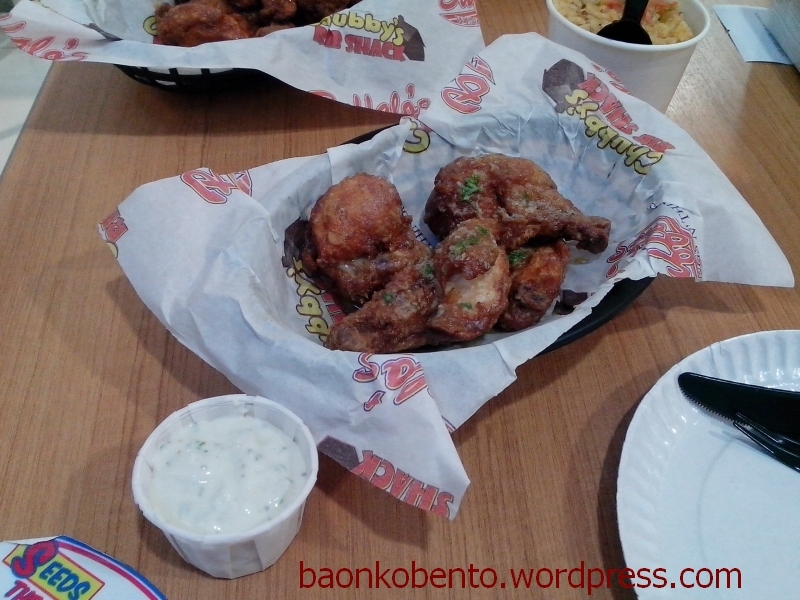 In our endless search for good places to eat, we stumbled upon Wingman on the suggestion of a friend. 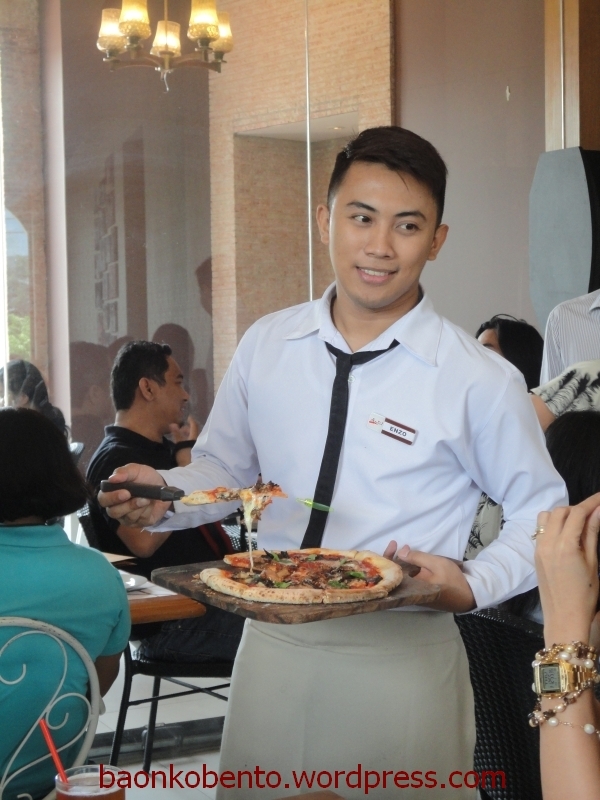 Wingman is located in The Collective, a commercial hub along Malugay Street. It took quite some time for us to actually go there, as Wingman is kind of hard to find or go to if you’re not very familiar with the back streets of Makati. To those who might be interested, here’s a map to The Collective. I will start off by saying that you might have problems parking there. There are only about six parking slots in front of The Collective, and if you’re not lucky enough to score one of them, you’ll have to make do with street parking. It appears that street parking here is acceptable, mainly because it’s a one-way street. There are parking boys to assist you, or maybe the security guard. Once you’re able to park, you will see Wingman as the leftmost establishment. It is long and narrow, and can seat about 20-30 people. The Man and I usually just take one of the couple tables along the bar. Here’s a view of the bar from our table. As this is Wingman, of course we have to try out their buffalo wings. We took the set of 12 wings, which we can order in two flavors. We tried out the classic hot and the hickory barbecue, with the bleu-cheese add-on. It comes with a side of raw carrot sticks and ranch dip. This costs Php350. I have to say that this justifies the name of Wingman. We also ordered Roast Beef Au-Jus, which is a roast beef sandwich that comes with a dipping bowl of what I can call steak juice. 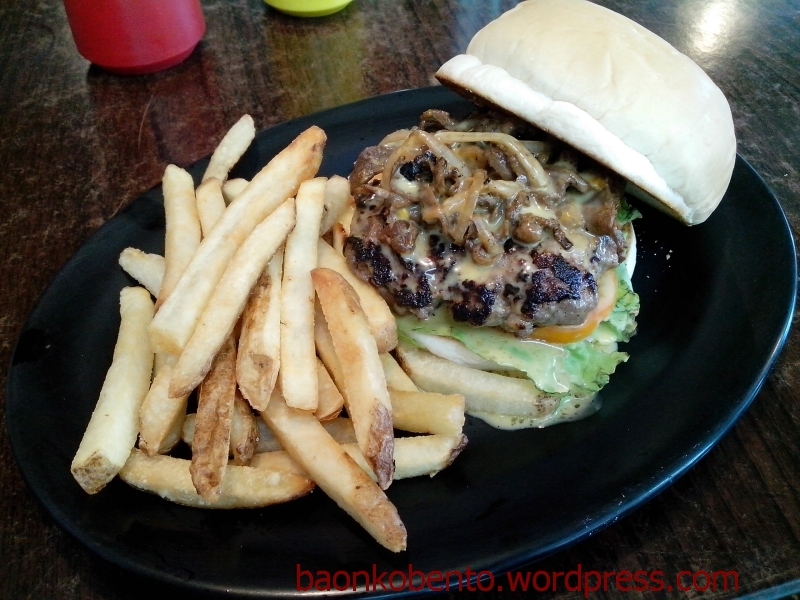 It costs Php260, and it already comes with a side (your choice of fries or onion rings). Conveniently it comes sliced in half, so the Man and I are able to split this sandwich without much trouble. This is amazing! We ran out of sandwich too quickly, and unfortunately Wingman does not offer any bready sides that we can dip in the leftover steak juice. I would say that I would gladly take a trip out to Wingman just for this dish. 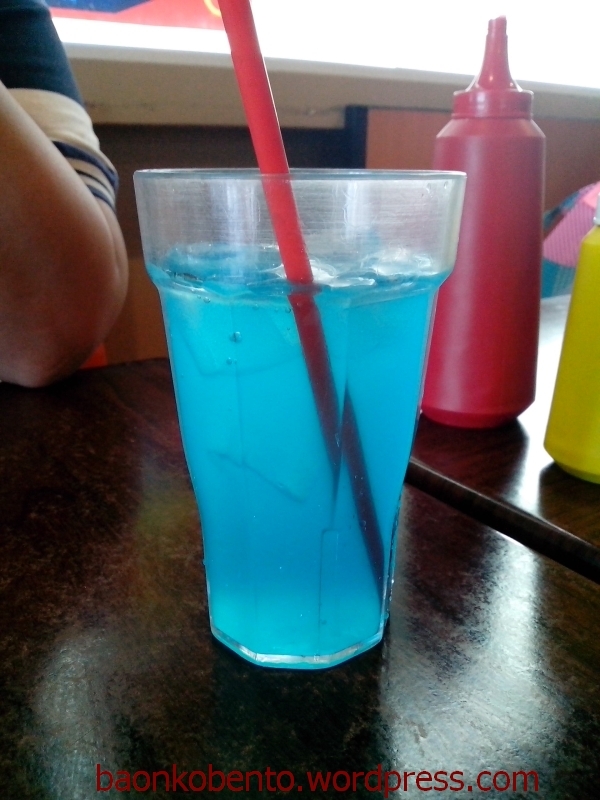 For our drinks we just got their bottomless lemonade, which came in this quirky shade of blue. Php80 each for this. Summary: Arguably the best place to get your buffalo wings fix. The drawbacks here would include 1. it’s also a watering hole (we aren’t really drinkers) 2. limited parking slots and 3. they don’t have a good place to wash your hands. The ambiance of Wingman itself is pretty great, but I’m docking points because of the location and lack of amenities of The Collective. We paid about Php800 total for two people. This article should otherwise also be titled “I can’t believe I’m writing this review.” I have long since scoffed at the raves I’ve been seeing online about Yabu. I have had experiences where the online hype was generally just that: to generate interest, but usually it doesn’t really have anything backing it. I’m glad and very surprised to say that Yabu rises up to the challenge more than adequately. 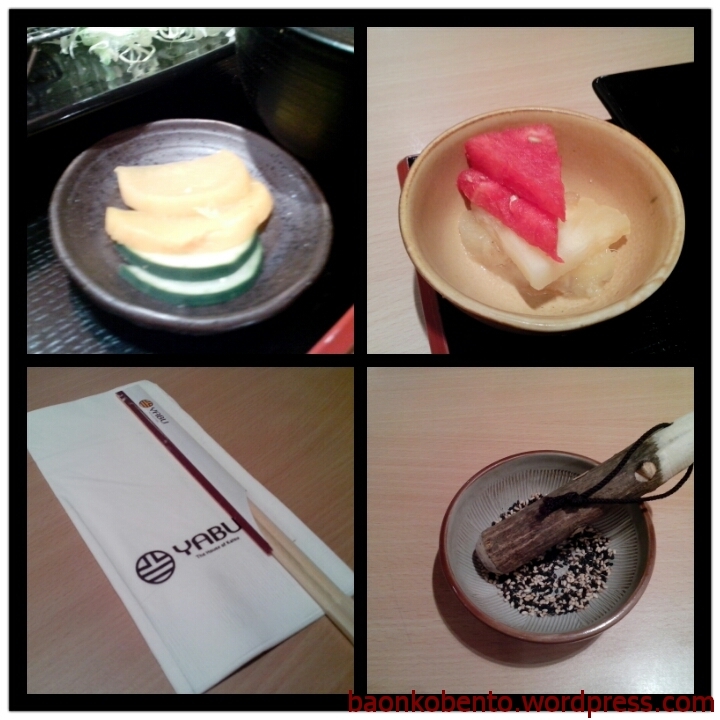 The Man and I finally found the time to try out Yabu, and we decided to see what it’s all about. First you are greeted with this nice little setup of condiments. 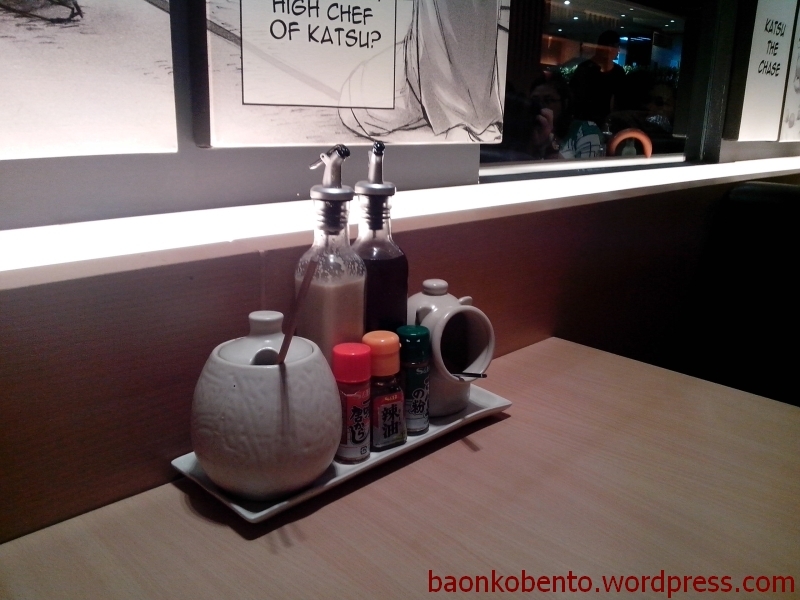 The tall ones at the back are the salad dressings, the three small ones in front are chili powder and oil, and the big pot on the left is the teriyaki liquid. I forgot what was in the right pot. The menu teaches you how to mix your teriyaki sauce. You are given a small bowlful of sesame seeds, which you are to crush to let out the flavor. 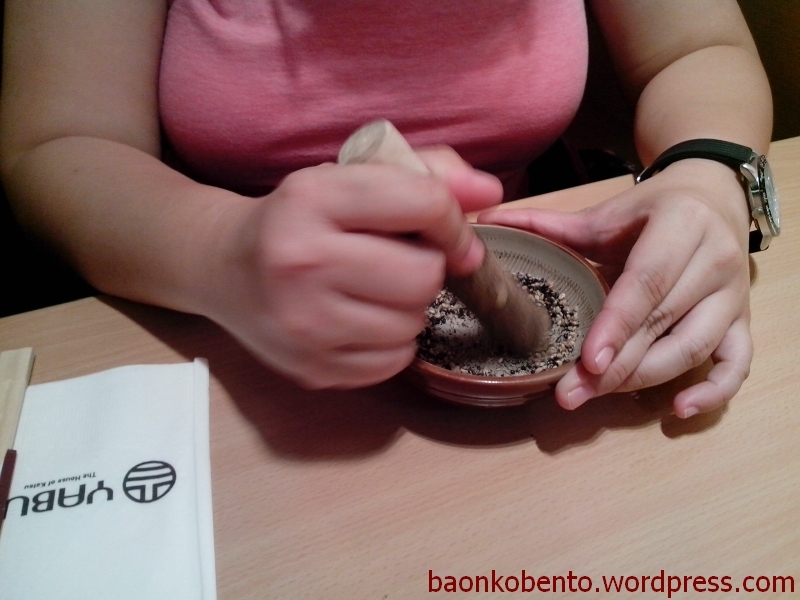 The Man chooses to keep his seeds whole, so he can use it as furikake (sprinkles over rice). Our individual orders came in. I got the seafood katsu set 1, which included cream dory, squid, scallop, a huge prawn tempura, and what is perhaps the hugest oyster I have seen. 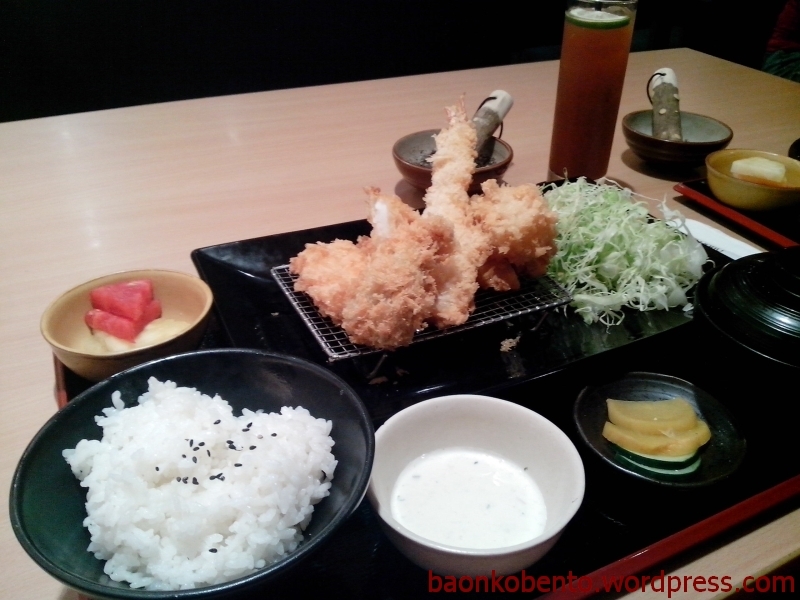 As with nearly all meal sets in Yabu, these come with a side of pickles, a small bowl of fruit, and unlimited rice and cabbage. I also got tartar sauce for the fish. 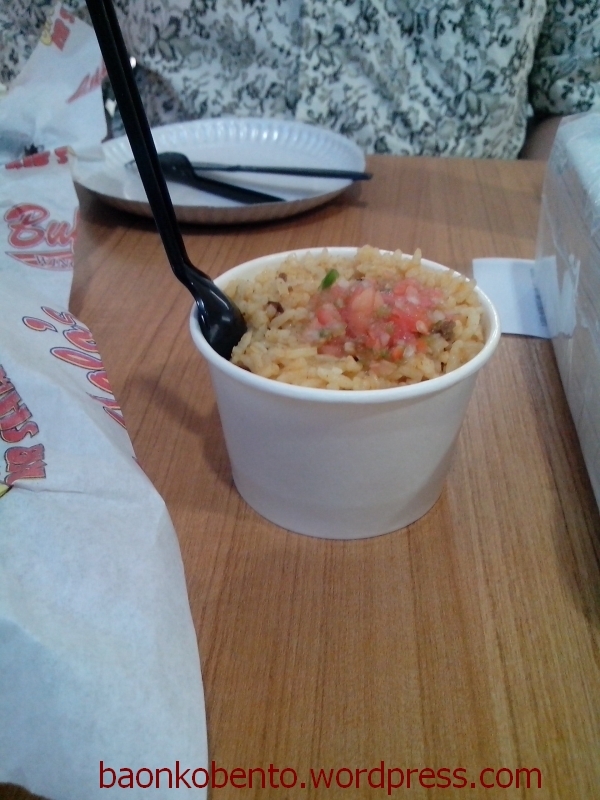 My meal costed Php485. Take a closer look at this oyster. This is awesome! 10/10 would go back just for this oyster. It may be a little too rich for me though, so I don’t think I would ever get the meal set that gives you four of these. That much rich seafood might give me allergies. 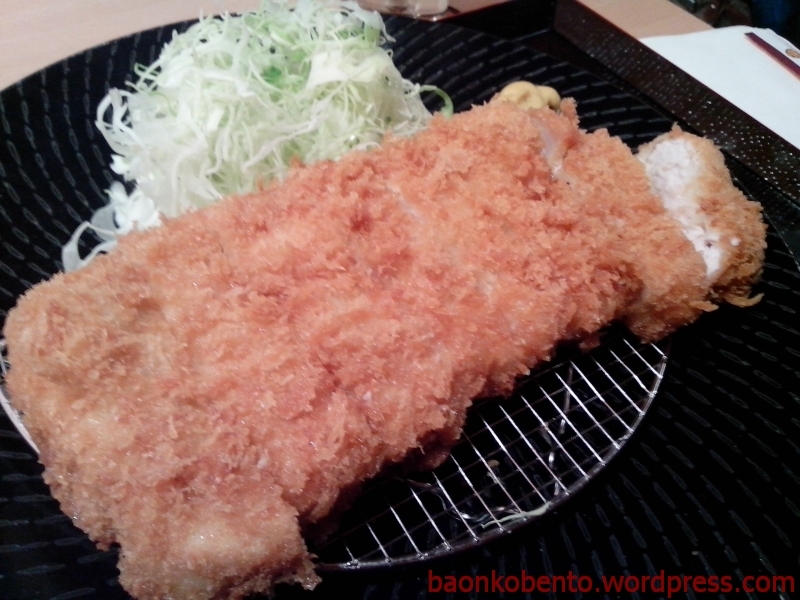 The Man chose a Rosu 180g set, which is a pretty big piece of pork katsu. 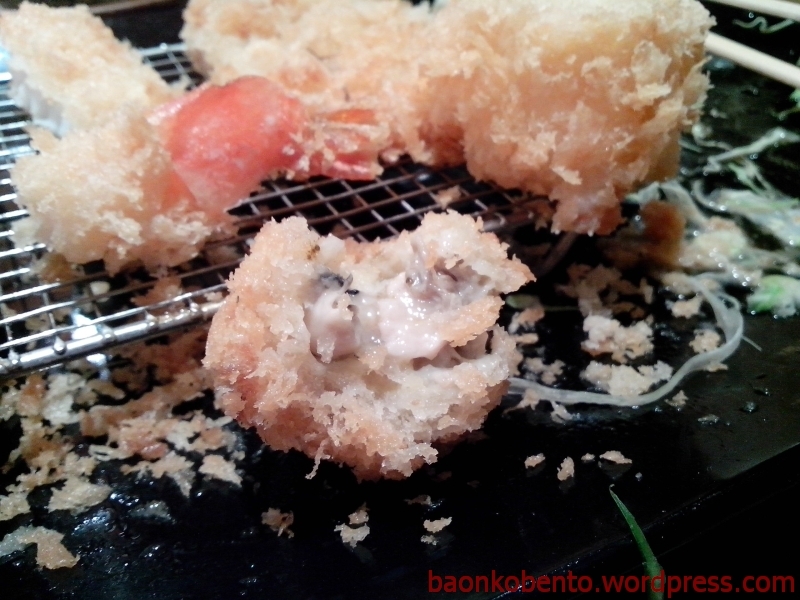 It’s nicely fried and sectioned, and since it’s not the premium pork, it has a bit of fat. This slab of pork can probably feed two people. 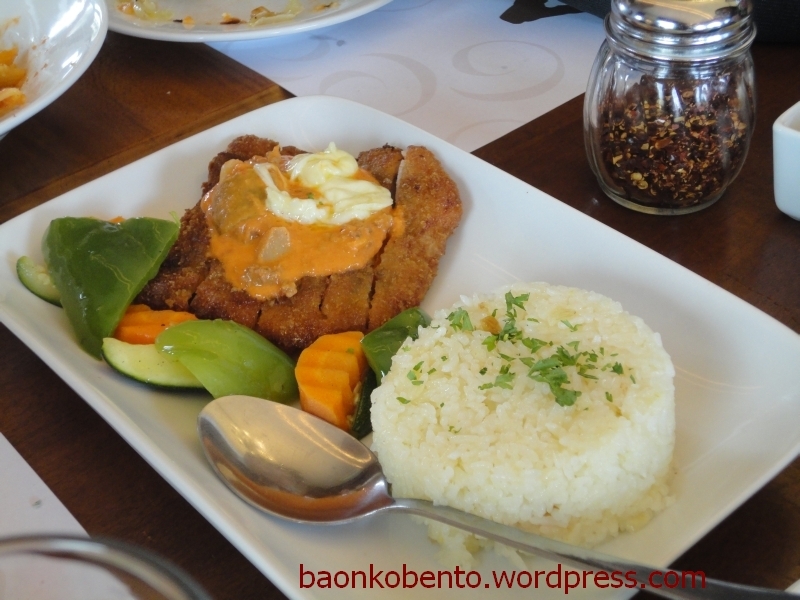 His meal costed Php405. 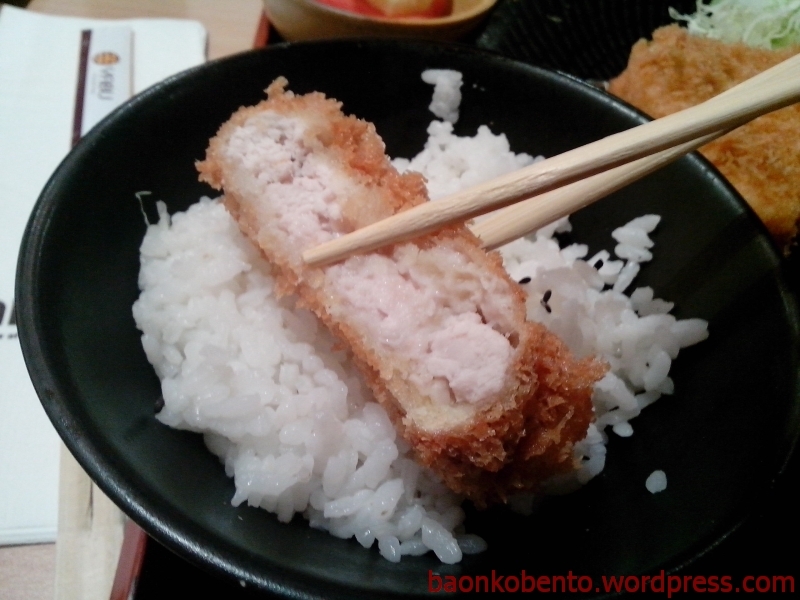 Here’s a closer look at a pork katsu slice. On the overall, it was a great experience. The staff was very friendly, and refills of rice, cabbage, and iced tea were offered frequently. Perhaps the only drawback one might encounter are the lines. Yabu has become pretty popular, and it’s not unusual to see a wait list before you can be seated. Summary: A very excellent meal! I am glad that the experience was able to support the online raves. We would definitely be back to try the other items on the menu. 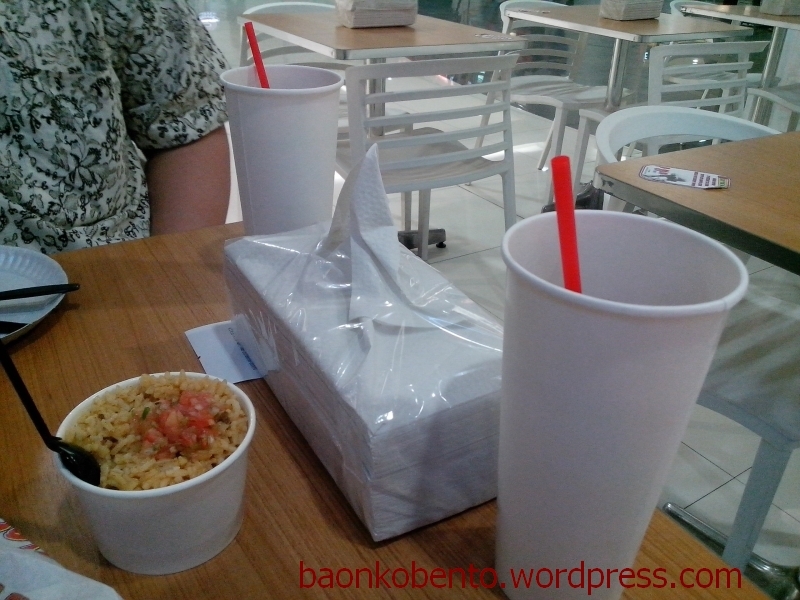 We spent about Php1100 total, as we also each got bottomless iced tea. One of the recent restaurants we tried recently is a very newly opened one appropriately and hilariously called Linkin Pork. As you may gather from the name, their specialty is pork, in the form of sausages (links!). One Monday evening we decided to give this a shot. 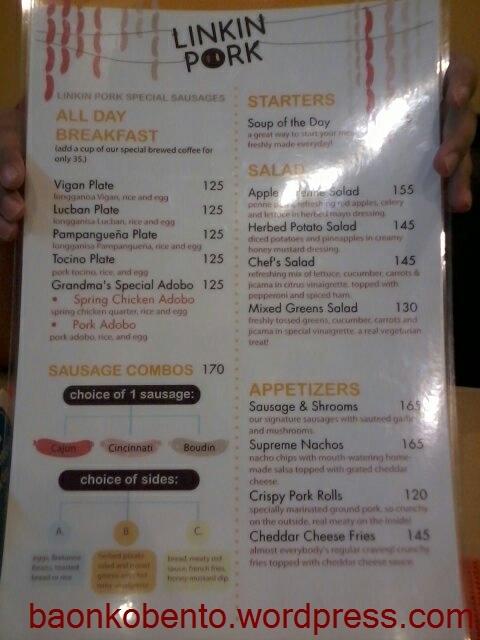 Here’s a very low res shot of their menu. What caught our attention is of course the house specialty: sausages! 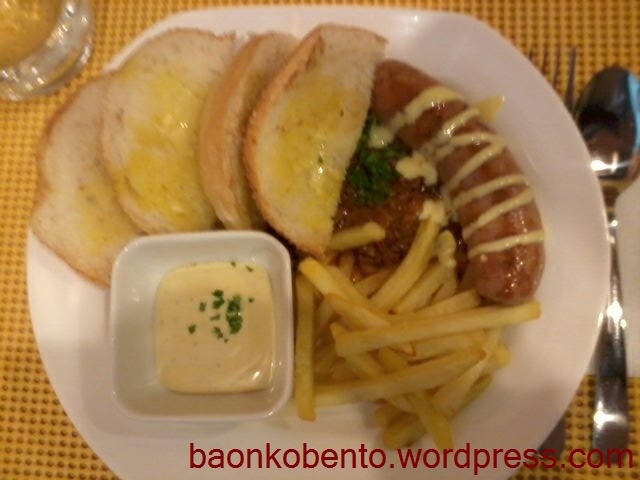 Here’s a close up of the three types of sausages they serve, and the meal combos you can make with them. 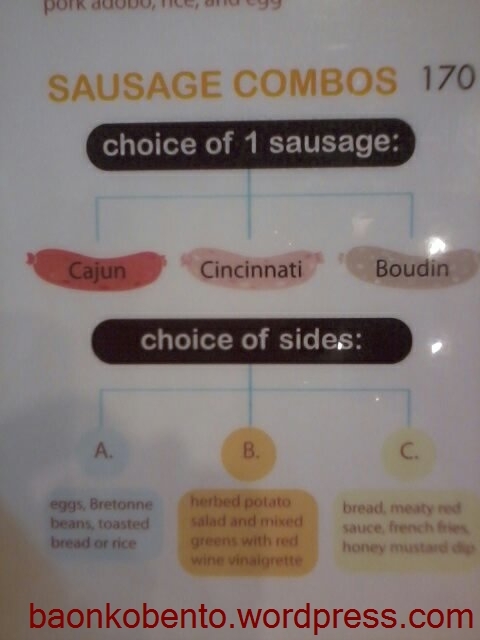 Basically, cajun is spicy pork sausage, cincinnati is the nonspicy version of cajun, and boudin is a pork-and-chicken sausage. Let me show you the things we ordered: First up, drinks! Iced tea and complimentary house water. I love their glasses! Playful posing for the camera while waiting for the orders to arrive. The Man’s order arrived first. 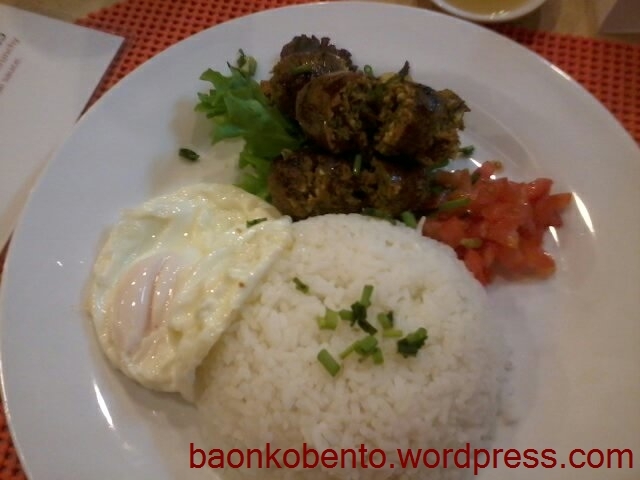 It’s a plate of vigan longganisa and rice, with a side of sliced tomatoes and fried egg. He chose vigan longganisa because this is the type of longganisa I don’t like, and we will definitely not be having this on a regular basis at home. Why don’t I like it? It’s a little bit too weirdly spiced for my taste. On the other hand, he loved it! The appetizer arrived next. 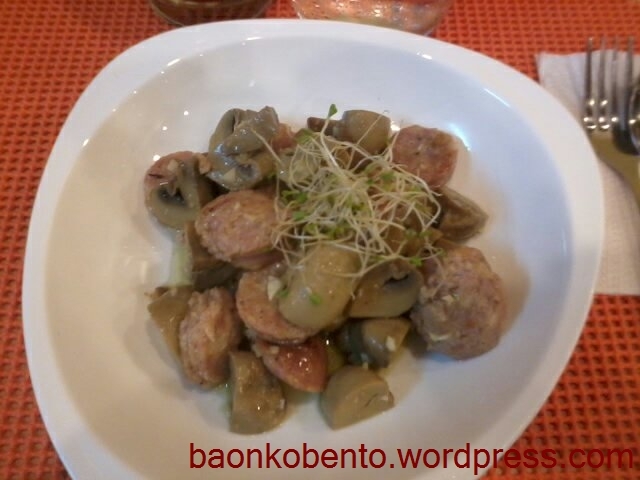 It’s fried sausage and mushrooms, topped with what appears to be wheatgrass or lemongrass. The sausage tasted like the cincinnati sausage. My order arrived next. It’s a cajun sausage combo B, which meant I got herbed potato salad and mixed greens with red wine vinaigrette. The sausage wasn’t as spicy as I was expecting, but it was pretty good! It had a slight cheesy taste, and was very tender. I swapped my potato salad for The Man’s egg. Lastly, Tee’s order arrived. It’s a cincinnati combo C, so she got bread, meaty red sauce, french fries, and honey mustard dip. Her sausage tasted the same as our appetizer. She loved everything on her plate! although she was not able to finish the sausage, and gave away her leftover red sauce. We also got to try out their coffee and cinnamon roll, courtesy of David (owner of Linkin Pork). They also have a coffee menu again appropriately called LinkinPerks! I love their naming conventions! Here’s a shot of the menu. My coffee is a latte with irish cream. 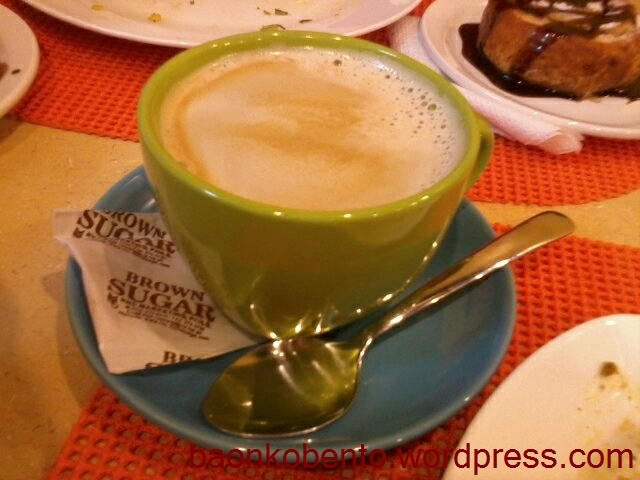 It was amazing coffee! 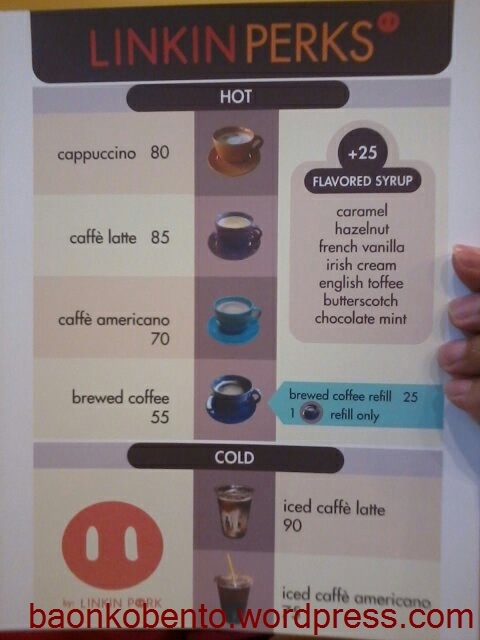 I would love to bring my coffeeholic dad here so he can try this. 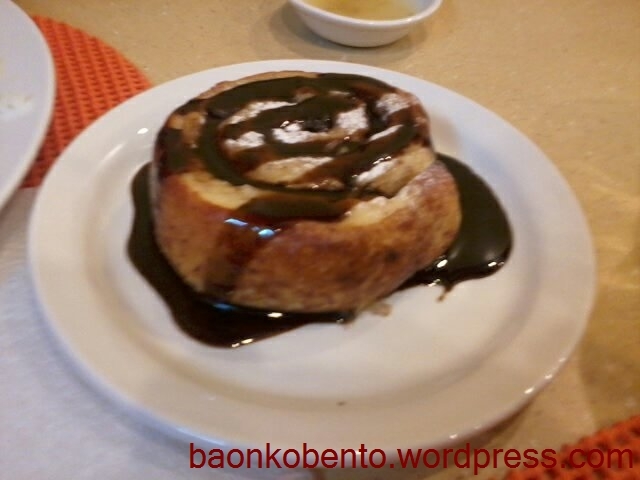 Lastly, here’s a pic of the cinnamon roll. I forgot to ask if this will be on the menu, but I sure hope so as this is amazing as well! Summary: Great sausages for a fair price. We paid about 800 pesos for the three meals, the appetizer, and the drinks. Will definitely be going back. Linkin Pork has two street parking slots, but they have more at the back. They also have provisions for functions on their second floor. Check out their facebook page here. Disclaimer: Linkin Pork is owned by my highschool batchmate David. He provided the coffee and cinnamon roll for free, but the rest are paid for by me. 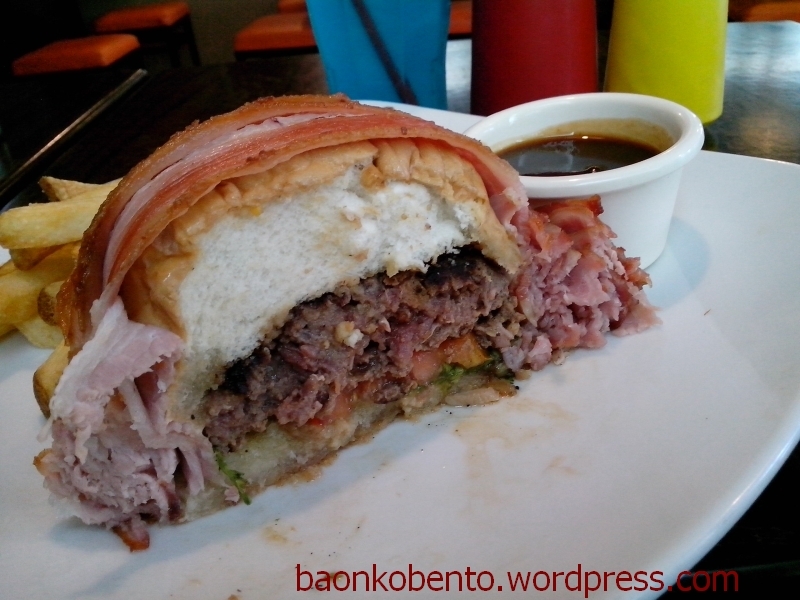 Restaurant Review: Sandwicheese Katipunan Ext. Finally, another review post! It’s been a while. My husband and I went out in the late afternoon for some errands. 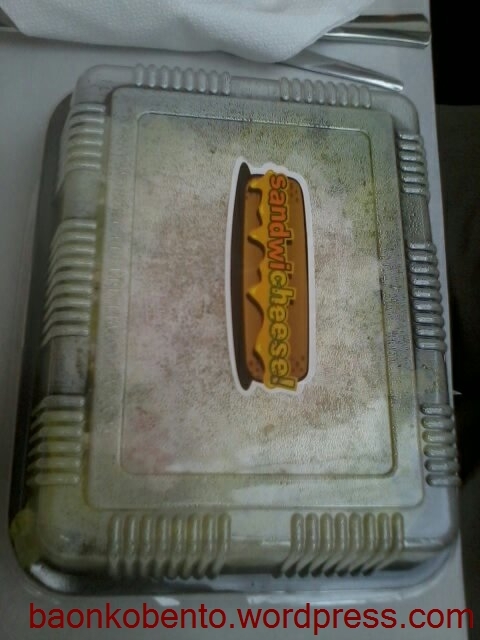 Since we have not eaten lunch yet, we decided to stop on the way south at Sandwicheese, located along Katipunan Extension. 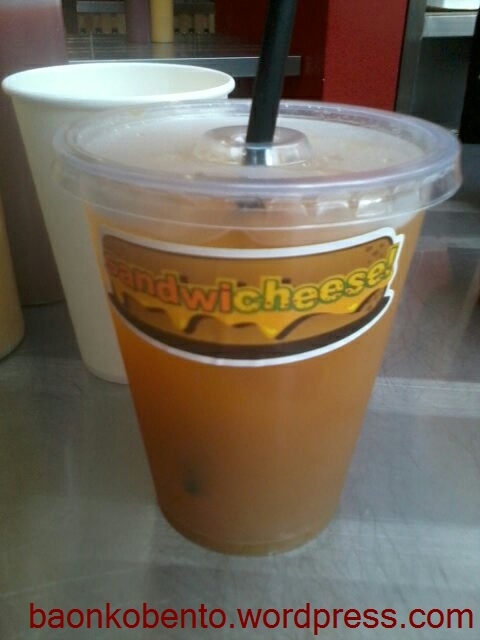 Sandwicheese is of the same company as Banapple, I think, and is in fact located near the first Banapple branch. We have always wanted to try Sandwicheese but was never able to find the correct timing. Finally we found a perfect time, and it was not crowded since it was some time between lunch and dinner. 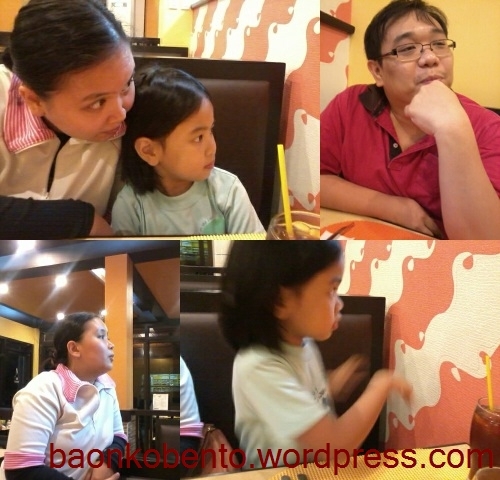 We each ordered their house blend iced tea (Php 60 each). 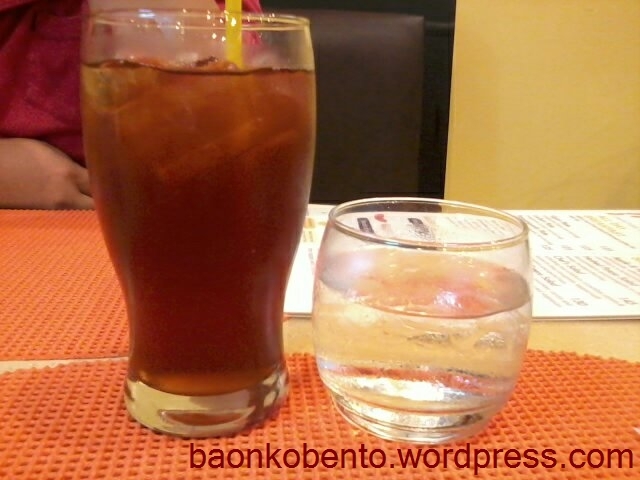 It was the same iced tea that Banapple serves, and it was great although it was not very big. They also gave us a glass of cold water each, without being asked. 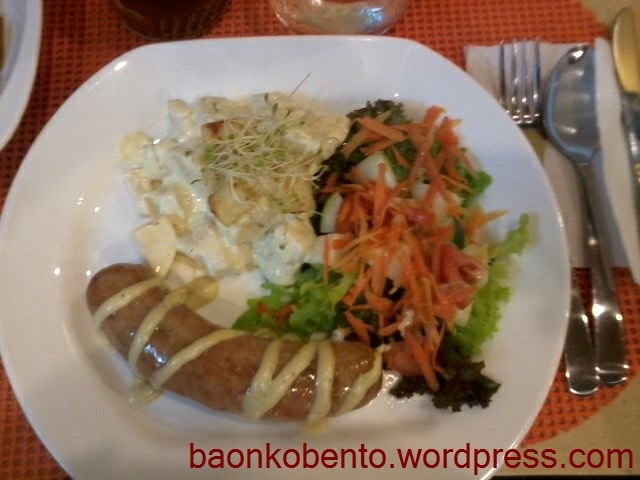 We also ordered the Banapple Potato Salad (Php 90) to share. This is a salad we’ve been ordering whenever we eat at Banapple, so this is nothing new. 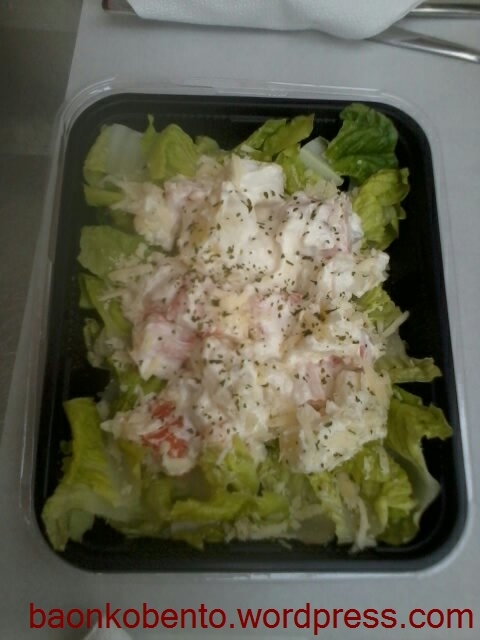 It is basically a carrot and potato salad tossed with a cream dressing (mayonnaise based, my husband thinks) and is spread over a bed of lettuce. I love this salad. Another side we ordered is their thick cut fries (I forgot what it was actually called, and forgot the price as well!). We just got the plain one, but you have the option of getting flavored fries. 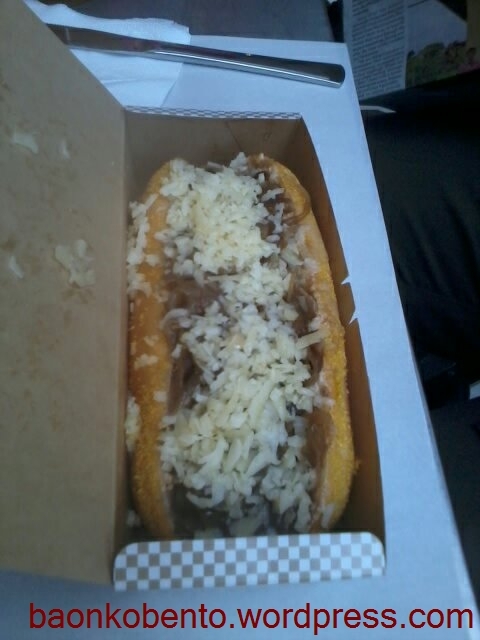 It came with a small container of blue cheese I think. 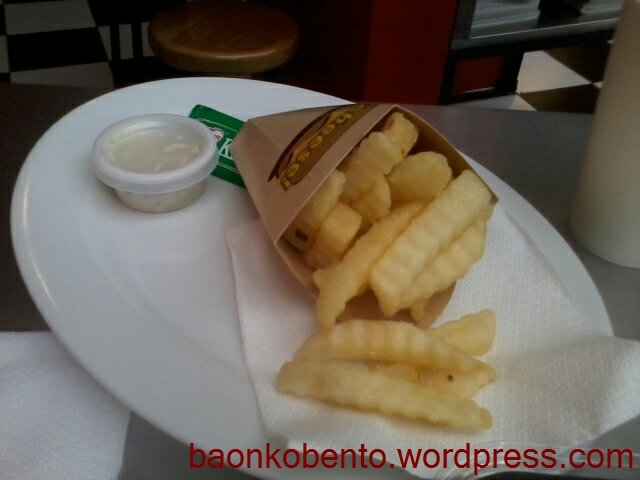 In my opinion this is their weak link, as I didn’t like their fries. They seemed too starchy, and seemed pretty redundant considering we already have potatoes in our salad. I gave most of my share to my husband. 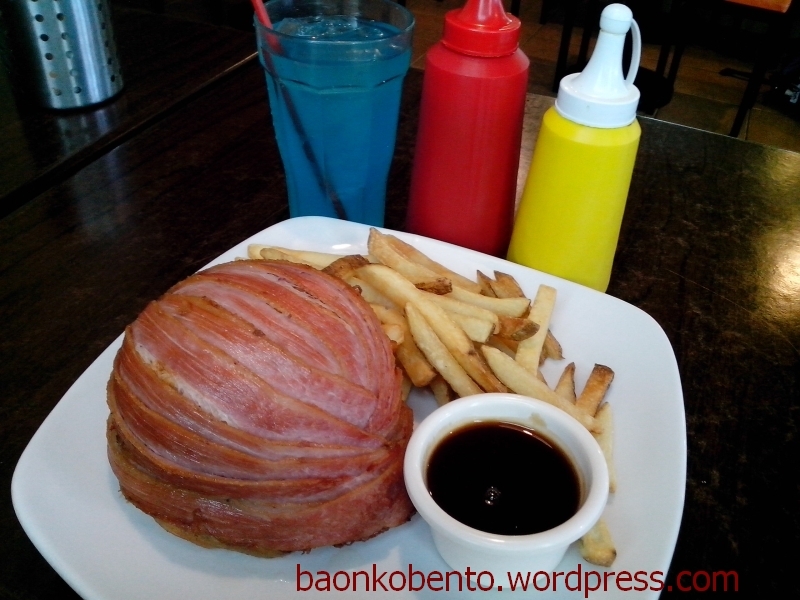 My husband ordered their Drippin’ Roast Beef Sandwich (Php 160). He seemed a bit disappointed that it was only a six-incher, but once he took a bite of it he immediately changed his mind! It was delicious! The beef was cooked perfectly and was very tender. The gravy was plentiful, and very tasty. 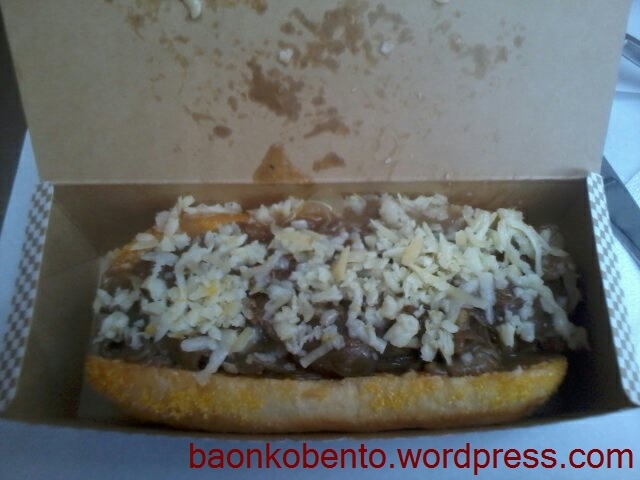 I ordered the Cheesy Roast Beef Sandwich (Php 160), which was identical in every way to the Drippin’ except for a layer of cheese pimiento underneath the roast beef. And, presumably, it has less gravy. I have to admit that I enjoyed this sandwich very much, and lamented that I couldn’t finish all of it. I would definitely be coming back to get this sandwich again. 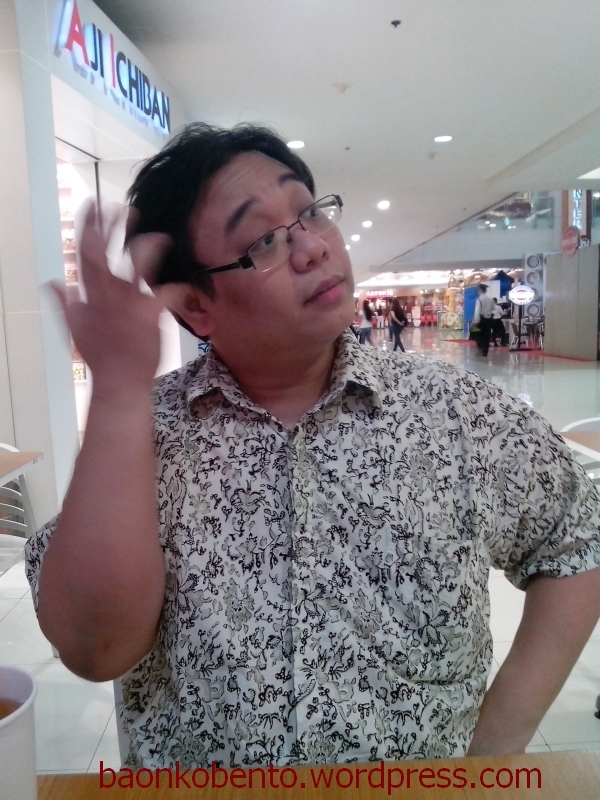 My husband, on the other hand, didn’t like the cheese pimiento (I gave him my leftovers, hehe!) and preferred an all-gravy topping. One caveat of eating the roast beef sandwiches is that one must be prepared to eat with her hands. It was a bit messy eating the sandwich, and the fillings kept sliding out. They do have a nice bathroom to wash in, so getting clean again should not be a problem. It’s not a really expensive place, in my opinion, and getting flavorful sandwiches seems to be worth its price. The place itself is also very small, can probably serve about 5-6 groups of 4. The parking is very tight, since it has to share with the stores beside it. 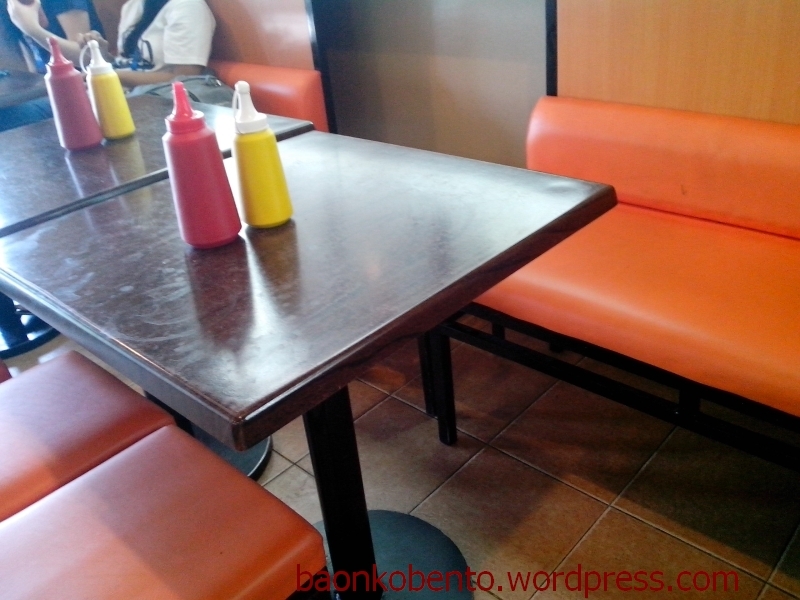 Summary: Great food and service, fair price, small place and relatively bad parking. Definitely worth going back to! Check out their menu at their facebook page.